As every graduate knows, there is no shortage of advice given to them when they begin their professional lives. Alex connected with the advice from Steve Jobs: “The only way to do great work is to love what you do.“ For her, the continuous thread inspiring her throughout her life was her family’s focus on making the world a better place for her brother James, who has Down Syndrome. 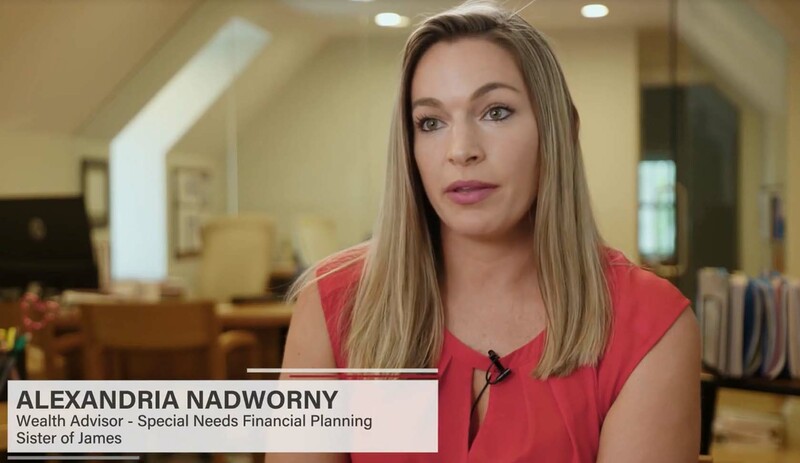 Alex began her advisory career working with traditional clients on retirement planning and earned her Certified Financial Planner™ (CFP®) credential. She joined Special Needs Financial Planning, continuing her own general wealth management practice and having a key role on the Special Needs Financial Planning team, working with client families to educate and advise the next generation of family members. She has been featured as a speaker and in the media on this topic. Understanding that no one can replace a parent, Alex created a program called A Team to Carry On; a succession plan for parents of adult children with a disability. The plan focuses on the time when parents are no longer able to do all they do for their loved one and provides guidance and encouragement to outline a team of family, friends, community and professionals to step in. Alex’s commitment has taken the team’s educational outreach efforts to a new level. She coordinates all workshops and presentations for the team and is a sought-after speaker in her own right, presenting special needs financial planning workshops to families, organizations and professionals nationally. Inspired by her family’s leadership in advocacy, she is an active participant in several organizations and fundraisers designed to benefit individuals with disabilities. Alex is the former President and current Vice President of the Massachusetts Guardianship Association (MGA) and is on the board of the Department of Developmental Services (DDS) local Citizens Advisory Board and is area liaison to the Massachusetts statewide Advisory Council. The Department is devoted to creating, in partnership with others, innovative and genuine opportunities for individuals with intellectual and developmental disabilities to participate and contribute to their communities as valued members. In addition, she was selected to be a part of the DDS initiative in Creating a CommonWealth. Alex is a CERTIFIED FINANCIAL PLANNER™ practitioner, (CFP®), a Certified Trust and Financial Advisor, (CTFA). Alex holds a BS in Business & Marketing from Western New England College. Aside from community service, Alex enjoys traveling, experiencing different cultures, photography and the beaches North of Boston. Important fact: Be prepared; know that if you are taking a meal with Alex, she may pull a bottle of hot sauce from her purse.